A sham marriage or fake marriage is a marriage of convenience entered into without intending to create a real marital relationship. This is usually for the purpose of gaining an advantage from the marriage. "A sham marriage or civil partnership is one where the relationship is not genuine but one party hopes to gain an immigration advantage from it. There is no subsisting relationship, dependency, or intent to live as husband and wife or civil partners." While referred to as a "sham" or "fake" because of its motivation, the union itself is legally valid if it conforms to the formal legal requirements for marriage in the jurisdiction. Arranging or entering into such a marriage to deceive public officials is in itself a violation of the law of some countries, for example the US. After a period, couples often divorce if there is no purpose in remaining married. Sham marriages are distinct from marriage fraud, which is a type of romance scam, in which one spouse is unwittingly taken advantage of by the foreign spouse who feigns romantic interest, typically in order to obtain a residence permit or for money. Common reasons for sham marriages are to gain immigration, residency, work, or citizenship rights for one of the spouses. There have been cases of people entering into a sham marriage to avoid suspicion of homosexuality or bisexuality. For example, Hollywood studios had allegedly requested homosexual actors, such as Rock Hudson, to conceal their homosexuality in a so-called lavender marriage. Since the introduction of stricter modern immigration laws in First World countries, sham marriages have become a common method to allow a foreigner to reside, and possibly gain citizenship, in the more desirable country of the spouse. The couple marries with knowledge that the marriage is solely for the purpose of obtaining the favorable immigration status, and without intending to live as a couple. This is frequently arranged as a business transaction with payment of a sum of money, and occurs more commonly with foreigners already in the country. In the UK the Border Agency issued guidance to clergy in April 2011 to help prevent sham marriages intended only to gain the right to reside. English and Welsh clergy may perform a marriage, according to the law there. They have been advised not to offer to publish banns for any marriage where one partner is from outside the European Union. Instead, the couple were to be asked to apply for a licence; if a member of the clergy is not satisfied that a marriage is genuine, they must make that clear to the person responsible for granting the licence. Since the Home Office hostile environment policy started in 2012, there has been criticism in the UK of heavy-handed action affecting genuine marriages. Genuine weddings have been interrupted, and dawn raids have been made to check whether couples are sharing a bed. People have been detained for months on wrongly being accused of being in a sham marriage. In 2018, 1,618 marriages reported by registrars as being suspicious were investigated; the Home Office refused to say how many were found to be sham. A senior registrar in Ireland said in August 2010 that he estimated 15% of civil marriages to be bogus, for the purpose of gaining residency. In United States immigration law, marriage not made in good faith and for purposes of immigration fraud is a felony, subject to a penalty of a US$250,000 fine and five-year prison sentence on the citizen, and deportation of the foreigner. The INS and the Justice Department said that they did not have accurate numbers on the rate of attempted marriage fraud. In the 2009 fiscal year, 506 of the 241,154 petitions filed were denied for suspected fraud, a rate of less than 0.09%. In Canada, legislation on sham marriages was strengthened in 2012. Continuous controversy arose regarding the issue; Canadian officials have been accused both of being too harsh and harassing couples and of being too lenient in deciding what is a genuine relationship.In addition, there have been objections to the policy from women's organizations, which argued that the new policy which requires the sponsor and the new spouse to live in a "genuine relationship" for two years endangers women who are victims of domestic violence. Although there is an exception to this rule in cases of abuse, the policy has been accused of being too weak (as abuse is difficult to prove). ^ Law Offices of Susan V. Perez. "A Bad Marriage is Not the Same as a Sham Marriage". HG.org. Retrieved 14 April 2019. ^ "Criminal investigation: sham marriage" (PDF). UK Government - Home Office. 19 August 2015. Retrieved 14 April 2019. ^ "Victims of Immigration Fraud". voif.org. Retrieved 23 May 2018. ^ "Romance Scams". Federal Bureau of Investigation. Retrieved 23 May 2018. ^ Canada, Immigration, Refugees and Citizenship. "Protect yourself from marriage fraud - Canada.ca". www.canada.ca. Retrieved 23 May 2018. ^ "Owner of Thai Ginger admits to immigration fraud – paying people to 'marry' her relatives". Bellevue Reporter. 2009-10-23. Archived from the original on 2009-10-28. Retrieved 2011-04-11. 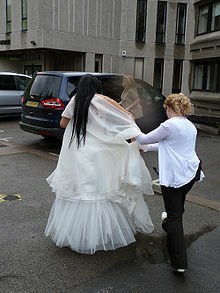 ^ "Thai Ginger owner sentenced for sham-marriage scheme". Seattle Times. 2010-02-19. Retrieved 2011-04-11. ^ Walter, Sim. "Convictions for bogus marriages soar to 284: ICA". Retrieved 26 June 2014. ^ "Bishops act to tackle sham marriages". homeoffice.gov.uk. 11 April 2011. ^ "Couples face 'insulting' checks in sham marriage crackdown". The Observer. 14 April 2019. ^ "Registrar warns of rapid rise in 'sham marriages'". The Irish Times. The Irish Times. 17 August 2010. Retrieved 14 April 2019. ^ "Just Say No to Immigration Marriage Fraud". The Law Office of Tanya M. Lee. Retrieved 2012-05-23. ^ "Investigating Marriage Fraud in New York". Ny Times. NY Times. June 11, 2010. Retrieved 2 April 2013. ^ "Marriage fraud: Canadian immigration officials tread thin line". thestar.com. 29 April 2013. ^ "Backgrounder — Conditional Permanent Resident Status". cic.gc.ca. ^ "Canadian immigration changes force women to stay with sponsoring spouse for two years". thestar.com. 5 December 2012. Academic article providing two telling examples of the fear of and resort to sham marriage in eighteenth-century England. Castro Santana, A (2015). "Sham Marriages and Proper Plots: Henry Fielding's Shamela and Joseph Andrews". English Studies 96 (6): 636–653. This page was last edited on 15 April 2019, at 03:07 (UTC).